Amongst all the ridiculous jars are also excellent products that you can safely use. And reliable, revolutionary ingredients, which actually help your skin, do exist. What they are and how can you best care for your skin, is exactly what you'll find in this book. Use this book als your guide, and soon you can enjoy having gorgeous skin. When you buy this product you earn 15 Reward points. "All about your skin is a guide to excellent products that you can safely use. And reliable, revolutionary ingredients, which actually help your skin." Dr. Jetske Ultee: "Do you, too, dream of having beautiful skin? In order to achieve that dream, have you spent a fortune on creams, lotions and serums? If so, you probably discovered some time ago that those products promise a lot - but do very little. The more I delved into the effects of cosmetics, the more shocked I was about the nonsense, the half- truths and the complete lies we are bombarded with from advertisements, TV commercials and the labels on all of those alluring jars, bottles and tubes. Cremes with lavender, citrus extracts, mint, eucalyptus or alcohol? Products with oxybenzone? Don't use them! In this book, Dr. Jetske Ultee shares her knowledge. Read how in a few months your skin can become more beautiful, more even and radiant, what to do and what not to do, which ingredients really matter. Armed with the knowledge from this book the world of cosmetics will have little secrets to you. Because knowledge is power, definitely when it comes to skin care. 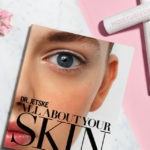 What are the delivery costs for Dr. Jetske Ultee’s Skin book? The regular delivery costs apply for the Skin book. These depend on the delivery country. For more information please see our frequently asked questions about dispatch and delivery.